Not sure why Excalibur saws are out of stock, but I do know they have a great following. One saw that just came out and is in the same price range and design is the new Jet 22” saw. I have been waiting on seeing some reviews of the Jet in comparison to the Excalibur but have not seen any yet. Here is a promo / sales video as that is all that seems to be out there for reviews? Of course top end if you can afford it would be a Hegner. The Dewalt DW788,s have slid in quality over the years but are still a decent saw. The new Jet has just hit the market so time will tell with it. Steve Good at http://scrollsawworkshop.blogspot.com/ is a very expericences scroll sayer. He recently checked out the Jet. Excalibur’s have been a great saw over the years. The only weak point on them in my opinion is the life expectancy of the blade tensioning lever. You can still find used Hawk’s out there as well. It all depends what you will do with your saw. 80% of all scroll saws never wear out because they are purchased an rarely used. 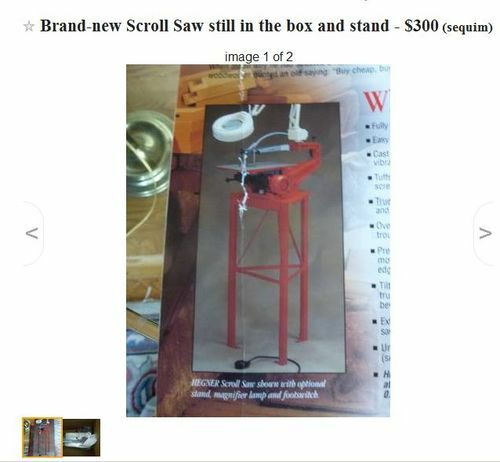 People quickly find out that little money is to be made selling scroll saw art or other projects. BUT if you enjoy great hands on contact with a piece of equipment, will enjoy hours of practice’ want a saw that will last for years, is easy to operate and very accurate, then spend the money on a Hegner. I have never heard anybody complain about the quality of a Hegner just the price. If you want to spend about a grand I would personally try the new Jet just for the experience of the new features it has. I see that but only at one speed. I would have liked to see them vary the speed to see what it would then. I was looking for excalibur parts and during my searching I saw a couple of write ups about General international. It appears that they have lost a supplier of parts in China and have stated that they are no longer manufacturing excalibur saws. Time will tell. Look for a used DW788 Type 1 … they pop up every so often on CraigsList. The DW788 Type 1 saws were made in Canada in the same factory that once manufactured the Excalibur for General. The DW788 Type 2 saws were manufactured off shore and they are the ones people have problems with. Two years ago, I was looking to upgrade from a 16” Dremel … lucked out when I found a DW788 Type 1 for $250 and have been happy as a clam with it. In my opinion, choosing a scroll saw should depend on what you plan to cut with it. I once had a DeWalt and I killed it, just out of warranty. People that do just fretwork have better luck with them. I cut lots of 3/4” – 2” thick hardwoods and for that kind of cutting I recommend a Hegner. Not a quick blade change saw but will outlast a DeWalt ten to one. I have one Hegner that was made in 1988 still going strong. The Hawk (formerly RBI Hawk) is still being made, I believe. Can’t name the current maker, though. I E-Mail General international a week ago and asked about when the saws would be available. I did not get any kind of response? I also E-Mailed Senco and asked about the Excalibur’s and he stated he had the Jets in stock. I re E-Mailed Senco and asked about the Excalibur’s and never herd back? Just a FYI…. The Hawk (formerly RBI Hawk) is still being made, I believe. Can t name the current maker, though. Sorry for your troubles…the fact is that we’ve had issues with the factory in Taiwan. We’re hoping that production will resume within the next few weeks, so that we can have product in JAN/FEB or MAR 2017. General International MFG Co. Ltd. I have had a Hegner since 1986 and have used it a bunch. I love the saw and the only thing I have had to replace was the blower and the blade clamps. The only down side is the price. If you are near Louisville ky send me a pm I have a Hegner that I would be happy to part with to a fellow jock. I was at the Grand Rapids, Michigan WoodCrafter store on Saturday and they had both the Excalibur and Jet saw sitting side by side. I did not get a chance to turn them on and use them but in review of both saws they look almost identical in every way except the table tops and the saw guilds . But in my review they also looked like the parts could be interchanged from one machine to the other. I was surprised that the parts were so identical in every way from what I could tell holes, bends, size, and shape you name it. I think Excalibur could lose some of their market hold due to them not being able to supply saws till MAR 2017 as they state in the e-mail they sent me and the similarities in the saws. I read this thread and enjoyed it but what I would like to know is a decent entry level saw to be used only for occasional work. To be clear, I would only be using it for projects that I can’t cut on my bandsaw with a 1/4” blade. I don’t need a Cadillac but don’t want to get a Pinto either. Is there a happy medium? Mostly I would be using it to cut 1/4 ~ 3/8 hardwoods. I’m investigating this because I need to cut a swan neck clock top. Thank You for any advice. I know of someone located near Redding California who has an Excalibur 21 still in the box. If you are interested, send me a private message and I will give you her email address. -- Don't ever run out of airspeed, altitude and ideas at the same time. Used Hegners show up pretty often and can get one used for$300-400. Parts are available and is a good saw.